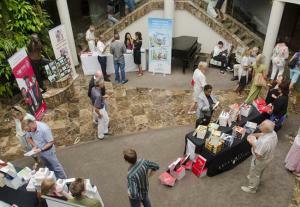 Come and join in this year's Knysna Literary Festival. This town is a mix of culture with a rich and colourful history. Not only does the festival celebrate the written word but it also stimulates education, as well as being committed to minimise its eco-negative impact. The event is ethically sound and embraces socially responsible principles and aims to reach out to Knysna’s residents and visitors to promote literacy as well as the best South African authors. The festival stands for the improvement of people’s minds through reading, creativity, and production. This year promises an exciting offering, from interviews and talks, to discussion groups with South Africa’s leading authors. Knysna Literary Festival (#KnysnaLitFest) will be hosted from 8th – 10th March 2019, offering a diverse and inspiring programme. Presented by Pam Golding Properties Knysna to promote South Africa's rich literary heritage, the Knysna Literary Festival is now in its 10th year. It is the Garden Route’s only annual festival that hosts an exclusive group of hand-picked authors from South Africa and is fast becoming a must-attend with bookworms and lovers of all things literary. This year, all events take place at selected venues around the iconic Thesen Islands, in the heart of Knysna, and topics and books are guaranteed to inspire lively debate both at the festival, as well as long after. Don’t miss out! Join us for this highlight on the local calendar.